In one of my previous posts I took a closer look at the specific energy production of both nuclear and hydroelectric energy. We saw that there are significant differences between the two. In the recent past other energy sources have continuously gained ground against them. In particular, wind and solar PV are considered to be production modes of the future, and maybe one day they may be the backbone of our energy-hungry society. However, for the time being, we are still far from this point. One of the reasons is that both of these renewable energy sources do not provide the necessary stability which is cruciall for running the power grid of a post-modern information society. Now let us look into the details. First we consider wind energy which has seen breathtaking growth rates in terms of installed capacity. However, installed capacity is not the last word when is comes to the actual performance of a particular production mode. Fig. 1 shows the average figures for wind energy for the period 1996 to 2010. Fig. 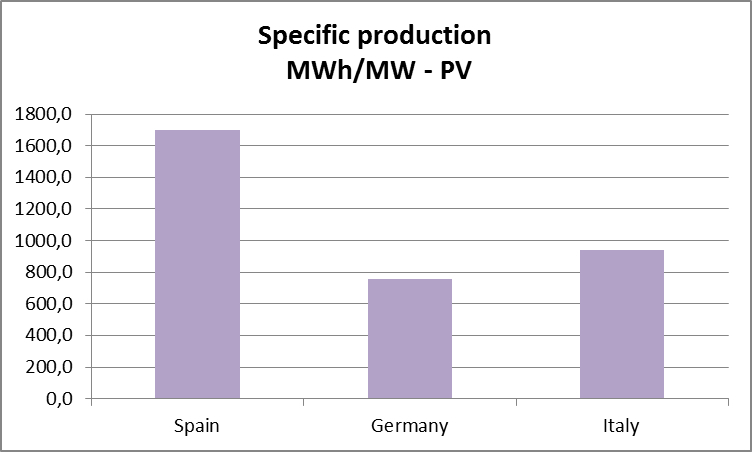 1 Sspecific energy production in MWh/MW installed for some selected countries. Germany, one of the countries with the largest installed capacity, is doing significantly worse than the other countries shown in the picture. Overall we observe that the specific production figures are well below the ones we calculated for hydroelectric energy (Specific Energy Production – Nuclear and Hydro). Fig. 2 provides the same data for some countries which recently have done a lot of effort to promote the use of solar PV. Again, Germany is the performing worse than its competitors which in this case does not come as a surprise since sunshine hours are much more abundant in Spain and Italy. The data represent average values for the period 1990 – 2010. 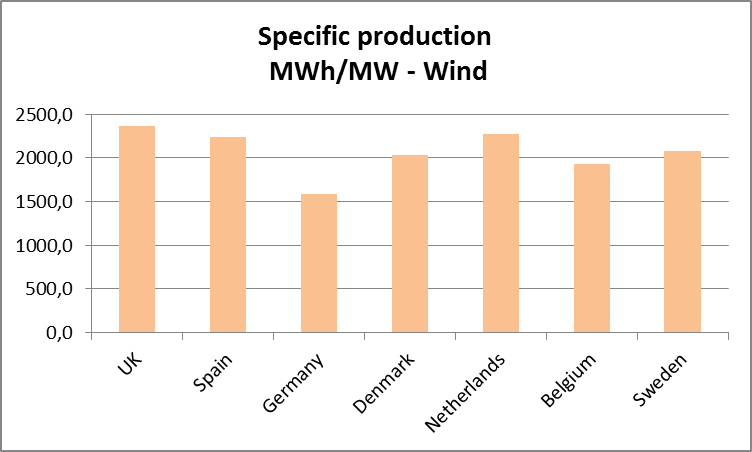 Solar PV is no match for wind in terms of specific output. To produce the same amount of energy in MWh one has to install a much larger capacity of solar PV than wind mills, since the former ones have an average specific output corresponding to only 54% of wind energy plants. Similarly, the specific output of wind mills is equivalent to roughly 58% of the one for hydroelectric plants. Quite astonishingly, a similar relationship exists between hydro and nuclear with the specific output of hydro corresponding to about 50% of the one for nuclear plants. In a nutshell, in order to obtain the same production figures as nuclear power installations one needs to install almost seven times as much capacity of solar PV and more then three times as much capacity of wind generating power. Last week we investigated the performance of German wind farms which, after a massive surge in capacity over the past two decades, are now in a position to contribute substantially to the electricity mix (7.6 % in 2011 according to the national statistical office). However, as we have seen, this comes at a price. The contribution shows large and largely unpredictable variations which have a destabilising effect on the grid. Another source of renewable energy which has gained a lot of support recently is solar PV. Like wind PV has soared dramatically in the past years. Nevertheless, its overall contribution to the energy mix is very low (3.1 % of total power generation in 2011). Moreover, like electricity produced by wind mills, PV is a factor of instability to the grid. The sun is not shining uniformly throughout the day. Passing clouds may severly impact the output of solar cells causing fluctuations in the supply chain. Impressive growth rates in both capacity and production, are inclined to mislead the observer. 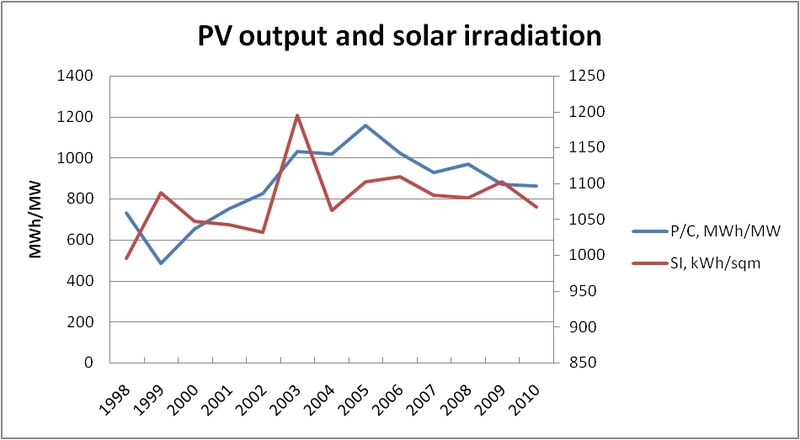 A more thorough consideration of the situation of solar PV, however, will have to look at the output per MW installed. That is the quantity which allows us to assess the investment in that energy source. Like in the case of wind farms, the expected productivity of solar PV depends heavily on the location. And thus, we should not be surprised to see huge differences between various installations. Here, however, we look at the global picture. This point of view is even more justified since Germany decided to abolish all nuclear plants by 2022 which, in turn, means a higher burden for all other sources of energy. As the country, simultaneously, is highly committed to reducing its carbon footprint renewables are bound to play a much larger role in the future. Fig. 1 Solar PV in Germany. Average output per MW installed capacity and solar irradiation. Fig. 1 shows the average PV output (P/C) in MWh/MW (blue curve) while the red curve refers to the average solar irradiation (SI) in kWh/sqm (r.h.s. scale). The performance per MW installed has been adjusted by using a specific model in order to account for extra capacity added over the course of a year. The two curves appear to follow a similar trend. Nevertheless, their correlation is quite weak. An increase in irradiation may even coincide with a downturn in specific production. Thus, on a global scale, more sunshine does not necessarily mean more solar energy produced. Over the period in question we get an average PV output of 868.8 MWh per MW installed with a spread ranging from less than 700 MWh/MW to 1157 MWh/MW. Fig. 2 Solar PV in Germany. Deviation from mean output per MW installed (P/C) and solar irradiation (SI) in %. Fig. 2 displays the deviations of both specific output P/C and solar irradiation SI in % over the period in question. This picture confirms the conclusions drawn from Fig. 1. 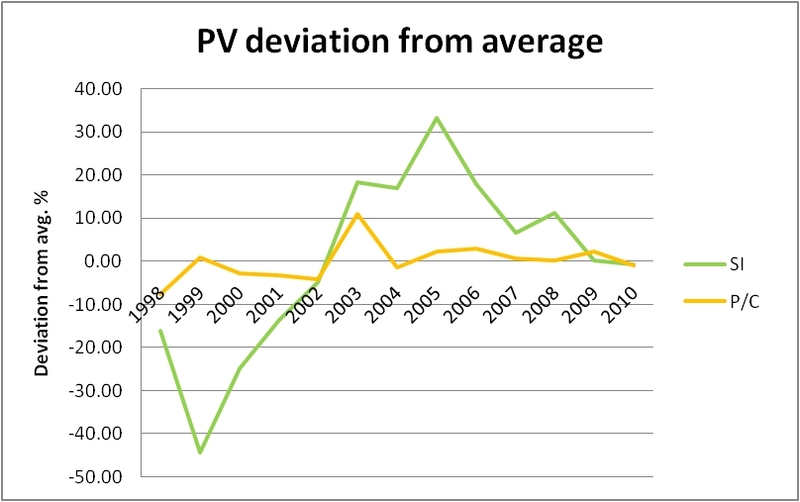 The variations in PV performance are not necessarily reflected in the respective variations of solar irradiation. They may even go in opposite directions. Remarkably, the fluctuations in SI are much larger than the ones in P/C, at least on an annual scale. As in the case of wind more capacity does not always mean more output. The availability of sunshine comes in as a crucial factor which may be decisive for the performance of a particular facility. And, like the wind, this quantity may vary a lot over the years as can be inferred from the green curve. There is one more message hidden in Fig. 2. One may argue that due to the relatively small scale of solar PV in terms of the entire German power production, the variations in P/C do not fully reflect the varying nature of solar irradiation. In other words, one might expect them to become even larger as the number of PV installations increases. This in turn implies that the fluctuations in the power grid may be even disrupting than today. In view of this it is of utmost importance to develop storage facilities for the solar energy produced. This should in fact be a priority. How Much Energy Do We Actually Need?